So my stepdad was holding the stroller ransom until he could see the baby, which meant I was somewhat housebound until Sunday when we finally picked it up. This, in a word, sucked. Happily, my doula Connie stopped by our place when Phoebe was 2 weeks old just to see how things were going and to -- of course -- hold the baby. I feel like I need to pause a minute to tell you if you are pregnant, trying to get pregnant or currently in labor -- please do yourself a favor and hire a doula. I am dead serious. I wish I could explain the amount of help and comfort she provided while I was in labor, but there's no way I could put it into words. I may post more about it later, but I have to say again -- doula. Find one and hire her. Do it. So anyway, I was able to ask Connie all sorts of questions and just generally talk about the baby. One of my questions was about cloth diapering (there's about 500 different ways to fold the cloth diaper inside the covers and I couldn't figure out the best way for Phoebe's body and the covers we had) and I also mentioned our lack of stroller. She told me to get a sling. Well, we have a sling (we totally scored on a bunch of baby stuff from a local couple -- $150 for a Pottery Barn crib + mattress, Graco pack n play, high chair, and the sling). I had tried it out once, but was ... well ... not comfortable with it. I wasn't sure I had gotten Phoebe into the sling correctly. Connie gave me a brief lesson and we were ready to go. Phoebe and I have tried it out a few times since then and sometimes we're good and sometimes we're ... well ... not happy about it. The best part? I'm hands-free when I wear her. 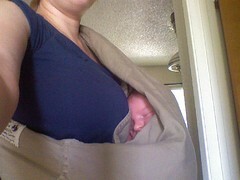 I have done laundry, dishes and drank beer all while rocking her to sleep in the sling. It's the best thing ever. I took this picture during our first successful day of baby-wearing. My friend Leanne got a pair of Coach sunglasses that were called "Phoebe" about a month before Phoebe was born (I received a text from Leanne that she was convinced the baby was a girl because the glasses she selected were called "Phoebe"). I gotta say ... I like my Phoebe accessory MUCH better.